Somewhere between my older brothers showing me horror films at a super young age, and not having much parental supervision with access to cable, I logged in many hours of strange movies and cartoons growing up as a kid. Not that it was bad; in fact it probably formed my aesthetics and love of the bizarre, tragic and just plain weird. Here are just 3 of the many movies I remember seeing and taping off HBO in the 80s — watching them over and over again. In the not too distant future, a very smoggy and overpopulated Earth government makes it illegal to have children for a generation. One couple, unsatisfied with their substitute robot baby, breaks the rules and gets in a lot of trouble. (Z.P.G. stands for Zero Population Growth.) This film pretty much scared the crap out of me on a social-political level as a kid. Most kids fear Nuclear War, I feared overpopulation. It was this movie that prompted my population control stance. 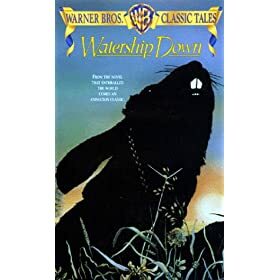 Based upon Richard Adam’s novel of the same title, this animated feature delves into the surprisingly violent world of a warren of rabbits as they seek to establish a new colony free of tyranny and human intervention. Frightening and bloody in some scenes. Not recommended for young children. Oh yes, but I watched it, over and over and over. I think my mom got this for my niece when she was real little — supposedly handled it okay until the very last scene with the dog. It is very possible for weird music and creepy animated movies written by acid casualties to haunt us from childhood, and I mean haunt in a good obsessive way. 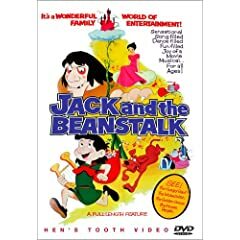 If you just think I’m weird in liking creepy animation as a kid, well then read the buyer reviews for this bizarre 1970s version of Jack and the Beanstalk. I had all the songs memorized, there’s even some twists on The Carpenters in the melodies I think.